Vectorcade is an all new original www.PlayVectrex.com digital arcade controller for your Vectrex! It's robust construction and beautiful finish make it a classic gamer's dream come true. Collectors can also appreciate its value considering only 50 unique units (serialized, & signed) will be made. 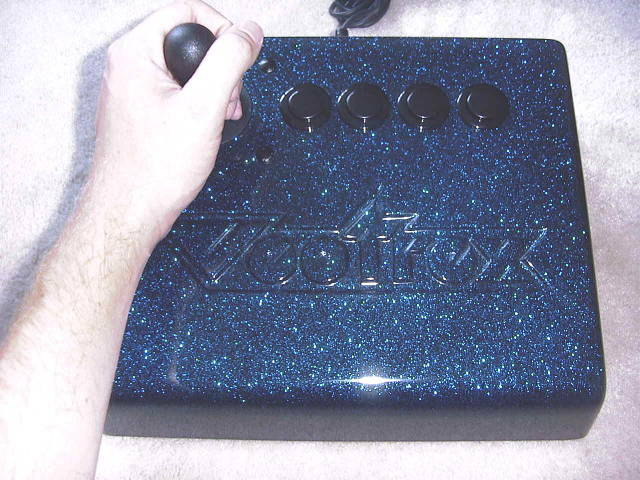 Production of the Vectorcade will end on 9/1/2002 regardless of the number created. Vectorcade units are sold on a first come first serve basis. Serial numbers will be sequential as Vectorcade units are created. Each and every Vectorcade will be a one-of-a-kind. 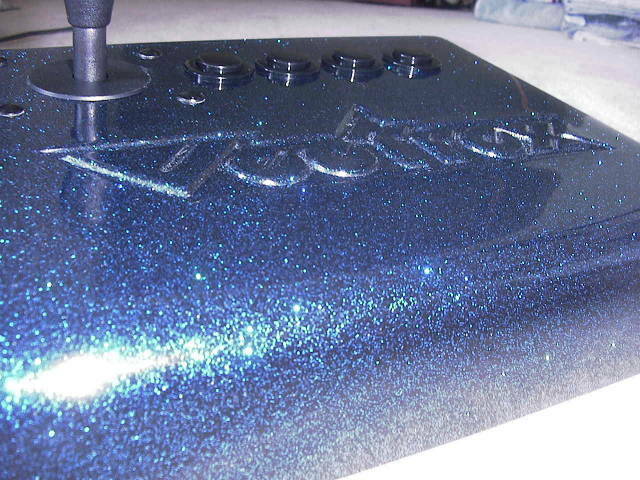 Each Vectorcade will have a serial #00-50, the owner's name, the color combination name, product name, completion date, and the creator's signature. This information will be made permanent. The controls and physical characteristics of each unit will be the same, with the exception of the joystick location which could be special ordered on the right side instead of the left. * NOTE: Color samples were very hard to get good pictures for. 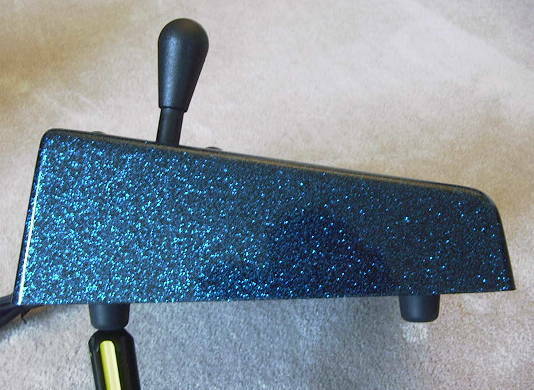 Colors may have more or less flake than shown. Flake will look smaller, more abundant, and sweeter in real life ;) Color samples will be added as I get them. Dimensions - 12.6" x 10.4" x 4.2"
Depth of "VECTREX" insert - 1/8"
Internal Wiring - Cable leads soldered to male connector pins to wiring harness with spade connectors on each microswitch contact. Images and info. for each Vectorade created will be archived in the Vectorcade Owner's Gallery. 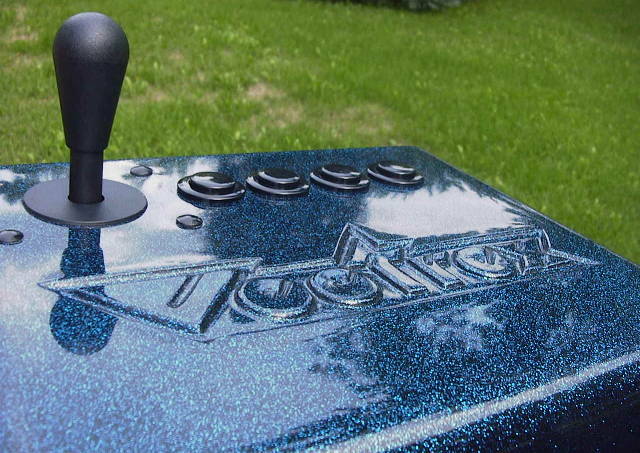 The only custom configurations that will be available for the Vectorcade are: 1) Color Combination Choice, & 2) Joystick on Right side instead of the Left side with buttons (4,3,2,1) from left to right. 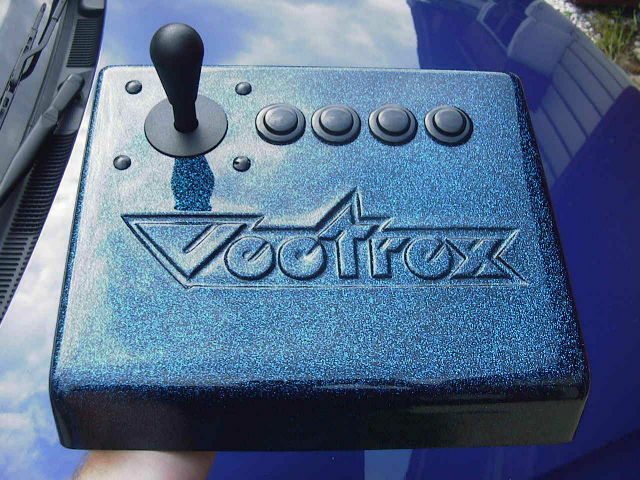 Currently, the way the joystick and buttons are wired for use with the Vectrex makes it too difficult to offer a universal output connection, which could be adapted to other gaming systems. However, you can easily remove the wiring harness inside and create your own. 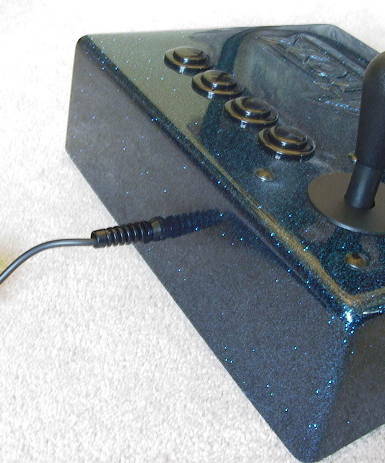 It would be possible to wire it so each of the 4 buttons, and each joystick direction pulls low to ground using the 9 pin cable...then you could create your own adapters for any game system you want, including the Vectrex. Or just re-wire it for the particular game system. 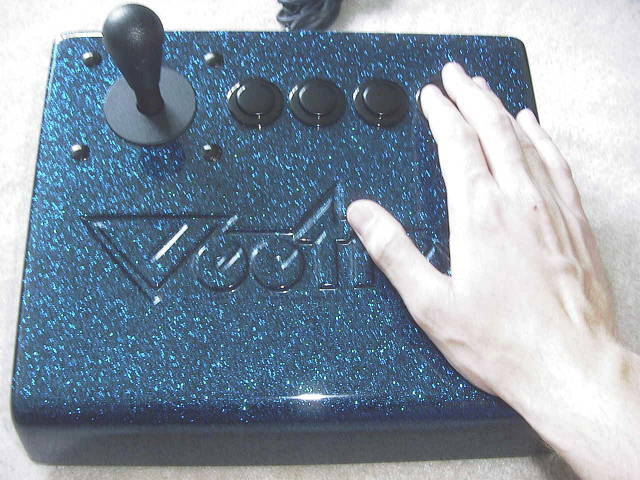 Although, I wouldn't think most would want to do that since the Vectorcade was created specifically for the Vectrex with the same joystick and button layout as the original controller. VECTORCADE PRODUCTION HAS BEEN PUT ON TEMPORARY HOLD UNTIL I CAN FIND MORE TIME TO WORK ON THEM. THE WAY THEY ARE ORDERED MAY OR MAY NOT CHANGE WHEN I START BACK UP. THIS IS MAINLY DUE TO PERSONAL REASONS, BUT I ASSURE YOU, PRODUCTION WILL CONTINUE AS SOON AS I FREE UP SOME TIME. THIS WILL NOT EFFECT UNITS ALREADY ORDERED AND PAID FOR, AND THERE ARE ABOUT 5 ORDERS UNPAID AT THIS TIME THAT I WILL HONOR ONCE A PAYMENT IS SENT. 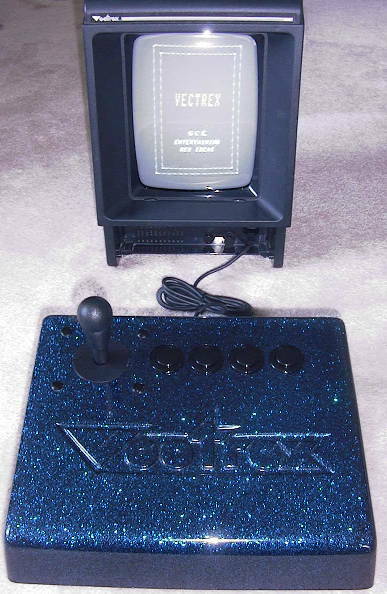 Size relative to the Vectrex. Left hand play, right hand taking picture. Right hand play, non-dexterous left hand taking picture. Are you looking at my joystick? The particular Vectorcade shown above is a prototype. Production units will look exactly the same, except better.